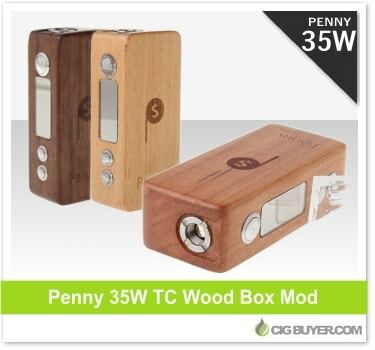 Here’s a great looking little wood box mod: the Penny 35W TC Box Mod. We don’t know much about the manufacturer, but it’s certainly a Chinese device like most products on the market today. The Penny wood box mod offers up to 35W of power with temperature control. It has a large OLED screen to display all of your standard settings and readings, along with a spring-loaded 510 and USB charging port. It includes a permanent 2200mAh battery and will fire down to 0.2 ohms – perfect for most TC and sub-ohm tanks.